Winter in the Great Lake State is a beautiful thing. There is nothing quite like the first real snow of the season. The softly falling snow covering the ground. The stark contrast of the wet trees against the white snow and gray sky. The quiet. I like it best when snow falls at night. I wake up to white, clean snow, undisturbed yet by foot traffic and cars. I take a deep breath and let the cold, crisp air fill my lungs. It reminds me of the fresh new day…open wide with possibility and opportunity. And then there’s this hat. She’s ready to get out there in the big bright world and make things happen. Meet the Great Lakes Beanie. The Great Lakes Beanie is sized for an average size woman. If you want to make it larger or smaller, increase or decrease in increments of 2 and add or subtract rows to get the correct length. This hat is made with Lion Brand Wool-Ease (thank you Lion Brand for providing this amazing yarn). Wool-Ease and Vanna’s Choice are both made by Lion Brand and are both worsted weight yarn. I find that the Wool-Ease is a little bit thinner and so it works up a little bit smaller. I’ve worked the Great Lakes Beanie in both yarns because I’m pretty much in love with this pattern. If you want to use Wool-Ease or another lighter weight worsted yarn and you are concerned about it being a little tight, you could bump up to an I hook. The stitches in this pattern are basic. What gives the Great Lakes Beanie that awesome texture is how it is worked. Pay close attention to whether you are working in the round, joining a round, or joining a round and turning your work to work on the wrong side for a row. I will talk you through it every step of the way! Are you loving the ribbing on the Great Lakes Beanie? The ribbing is just half double crochet post stitches, alternating between front post half double crochet and back post double crochet. It forms a rib that is just perfect. It stretches yet it is snug. I finished off the rows of post stitches with a row of single crochet. That row is entirely optional. If you like the look without it, you can just stop after the last round of post stitches. You can also increase the ribbing by adding another row or two of post stitches. Note: in the next section, work rows by starting and stopping each round, joining with a sl st to the start of each round. R30: ch 2, hdc around (72 st), join. R31-34: ch 3, *front post hdc in next st, back post hdc in next st* repeat * to * around. R35: Ch 1, sc around. Love the Great Lakes Beanie? Be sure to check out the Great Lakes Slouch! I love seeing your finished projects! If you share your Great Lakes Beanie on Instagram, be sure to tag me @crochet365knittoo. If you are on Facebook, stop over to the Crochet 365 Knit Too Facebook page and share a photo! I’d love to see your work! Written pattern copyright Cheryl Bennett 2017, all rights reserved. Please do not reprint or repost this pattern. 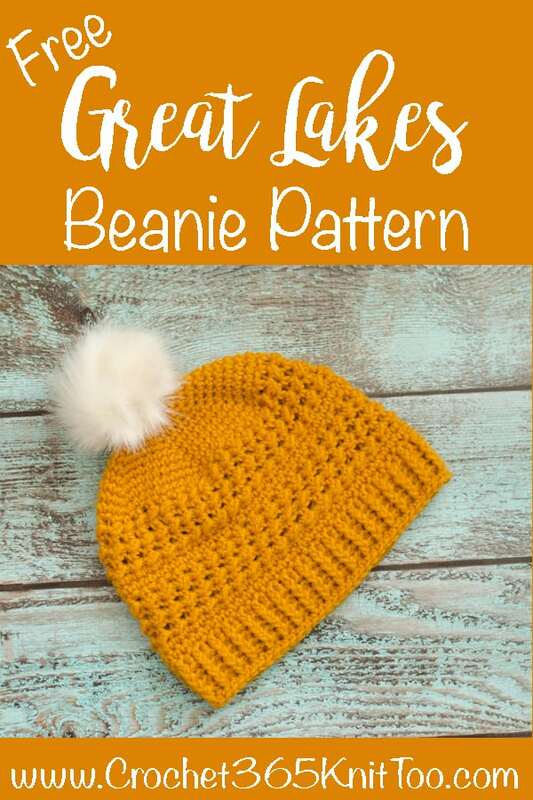 If you would like to share this Great Lakes Beanie pattern with others, just link to this page. If you’d like to make items for sale from this pattern, please visit my About page for more information. Thank you to Lion Brand for providing the yarn for this pattern. There is nothing quite like a winter in the Mitten state is there? Loving that hat! I just found your blog through Oombawka Design–so glad I did. I live in the Lansing area, and I’m about to go out to shovel yesterday’s snowfall. Living in the Great Lakes State is a mixed blessing–love to look at the snow; not so crazy about removing it. I love the look of this beanie–a good project for this afternoon as I warm up after shoveling. Thank you! Well hello, neighbor! 🙂 I am glad you found me! I agree with you on the snow. The removal part is not so fun. Thankfully for me, my hubby takes care of that task for us! 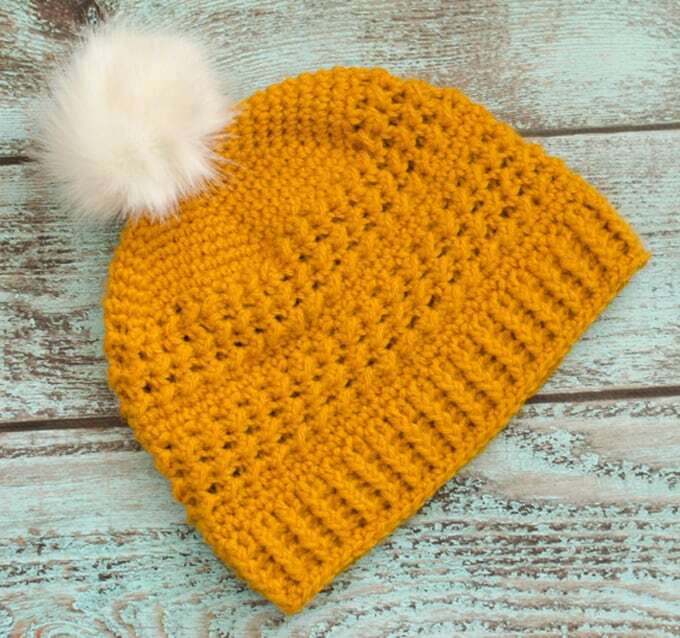 Enjoy making the beanie! That texture is amazing! Love the hat. Cheryl thank you for sharing your pattern. I love this hat, it’s super cute. I love working on a crochet project and watching it snow. I’m not crazy about the removal part of it either. I do have a two question. I love the texture and I would like to make this into a scarf or a cowel. I would just repeat rows 13 & 14 until it’s the width or length that I would like it to be? Would the muptiples be 2 + 1 or just any even number? I am so glad you love the pattern! I am thinking of making a cowl myself in this pattern too! Yes, the pattern is just a repeat of 2 stitches. So you would need to chain in a multiple of 2 and then an extra chain for turning. Rows 13 & 14 give you the texture. And then just single crochet to break up the texture now and then. Thank you, Cheryl. I think I’ll work it lengthwise, rows 13 & 14 twice then two rows of single crochets. I cant wait to make a scarf/cowel. ? 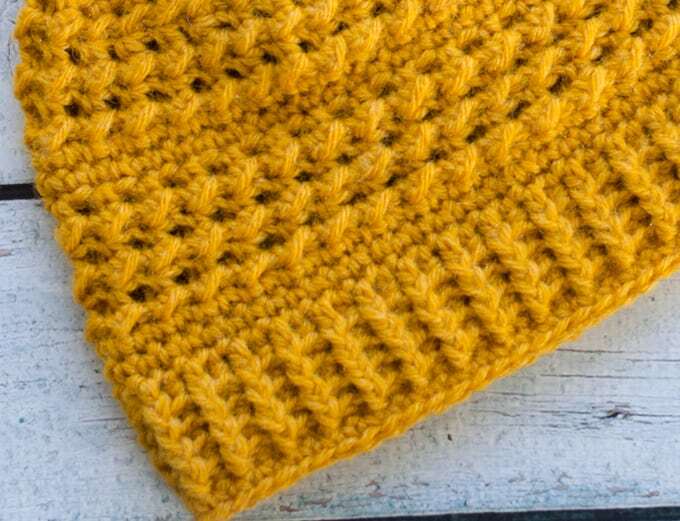 Christy–I thought about making a scarf with this stitch, too, but I hadn’t considered working it lengthwise–what a good idea! Thank you. Hello Cheryl. I have two question. For row 13, do you skip a stitch after the Sl st, hdc in same space? In the pattern for the hat you state there will be 36 bumps (that’s half of the stitches). For row 14, is the sc worked into the slip stitch or the hdc from the previous row?I’m making a scarf with your beautiful pattern and I don’t want to mess it up.? Hi Christy. In row 13, you are working into the spaces of the prior row. So when you are done, you will have 36 bumps. For Row 14, I like to work the sc in the hdc from the prior row. But you can really do it either way. Since you are making a scarf, try it both ways and see which way you like best. Just make sure that you end up with a total of 72 stitches at the end of the row (or whatever number of stitches you have to start with) I hope that helps. I am not sure what row you started on, but the pattern starts with a magic ring and 6 sc at the top of the hat and increases through row 12 to get to the 72 stitches. Be sure to scroll up so that you are seeing all of the pattern. 🙂 If you are interested in purchasing an ad-free PDF, there is a link at the top of the pattern as well. 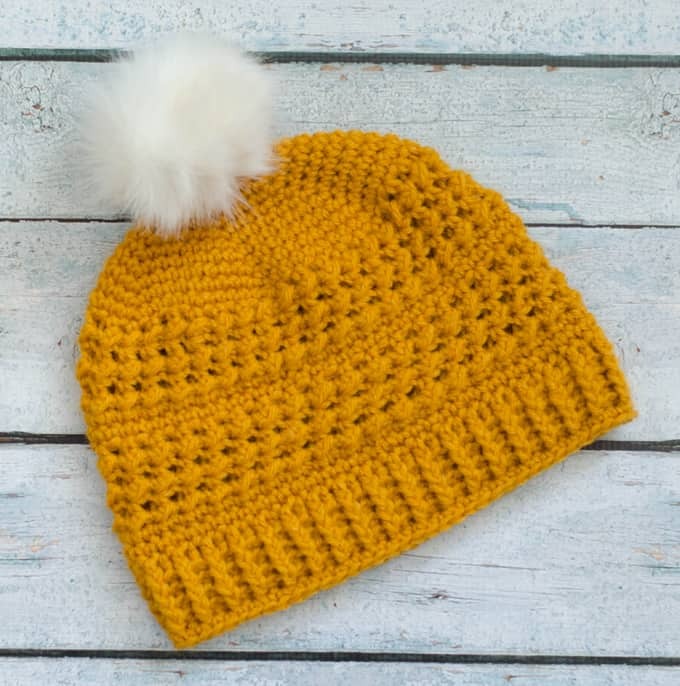 How many skeins of the Lion Brand Wool ease yarn did you use to make the hat ? A skein of Wool Ease is 3 oz and this pattern requires 4, so I used all of one skein and part of a 2nd skein. So if I wanted the hat a little bigger, I would start with 8 sc instead of 6? I would either start with a bigger hook or work extra increases–either in the last row, or add 1 more row of increases. If you start with 8 sc and work the same number of rows of increases, you are going to end up with a very large hat–because the increases build on each other. I’ve never made a garment by crocheting – so need to know in your “Make a magic ring” — how many do I first chain? You should chain 1 into the ring and then the sc as described in the pattern. I just finished a modified buck-eye beanie and I’m looking at your other hats for more inspiration and patterns to add to my list. I’m usually a knitter but am trying to expand more into crochet. Anyway, thanks for sharing your designs!